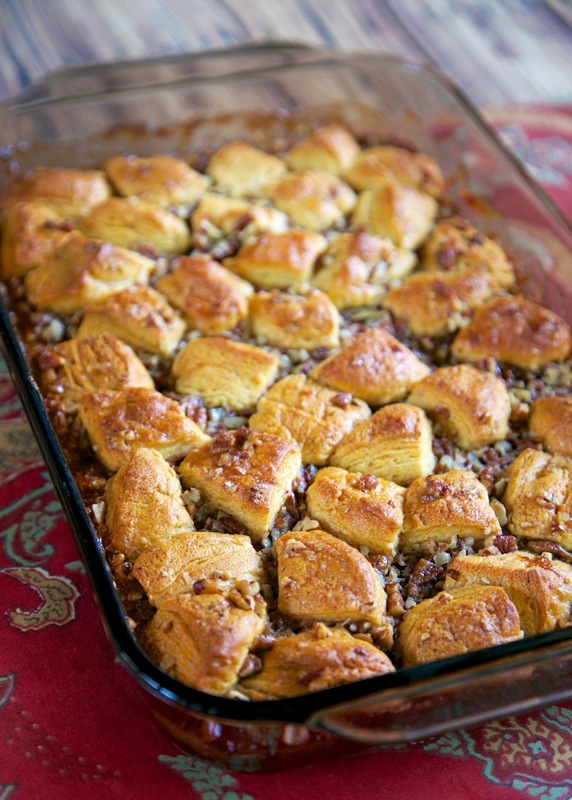 Pecan Pie Bubble Up - pecan pie filling tossed with biscuits - crazy good!! Serve warm with vanilla ice cream! Everyone LOVES this easy dessert recipe. Always the first thing to go! If you are a regular reader of Plain Chicken, you already know we are huge fans of "bubble up" recipes. We have tons of savory versions and we just made a sweet Apple Pie Bubble Up. It was such a huge hit, that I started thinking up other sweet versions. Thanksgiving is a few weeks away, and I was thinking about our menu. I came up with an idea for a Pecan Pie Bubble Up. I used my favorite pecan pie recipe and tossed with biscuits. It turned out amazing! We loved it warm with a big ol' scoop of ice cream. It is ooey, gooey and sticky deliciousness. We will definitely be having this on Thanksgiving this year! 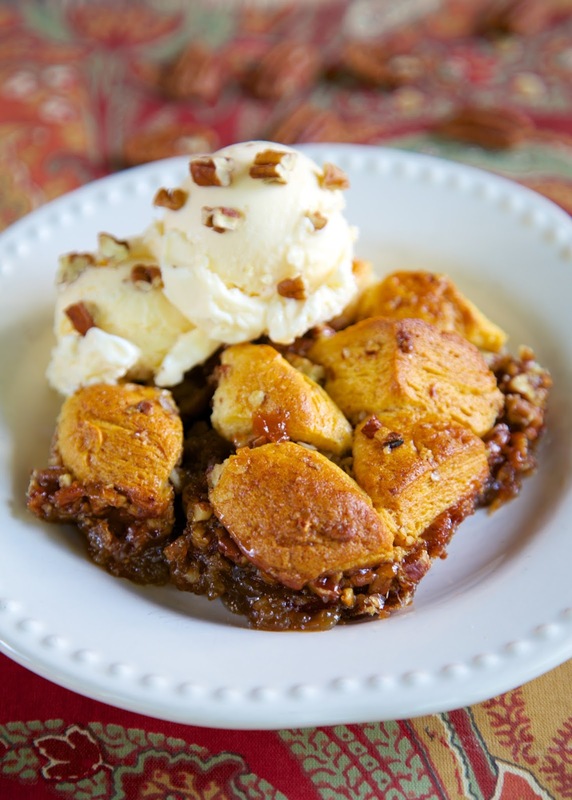 Give this a try if you are looking for a fun twist on pecan pie. Whisk together corn syrup, sugar, eggs and vanilla. Stir in chopped pecans. Cut biscuits into quarters and toss in pecan mixture. Pour mixture into prepared pan. Bake 25-30 minutes. Serve warm with ice cream, if desired. That looks sooo good! I must try this! Putting it on my list for Thanksgiving, too! OMG! Can you imagine a sweet potato casserole type bubble up? Fabulous. Use all but one biscuit & cut them into 6 pieces. Keep everything else the same. Just wanted to check in and let you know I made this for Thanksgiving- it was FABULOUS! This will definitely be made again! Thanks for another good one, Stephanie!